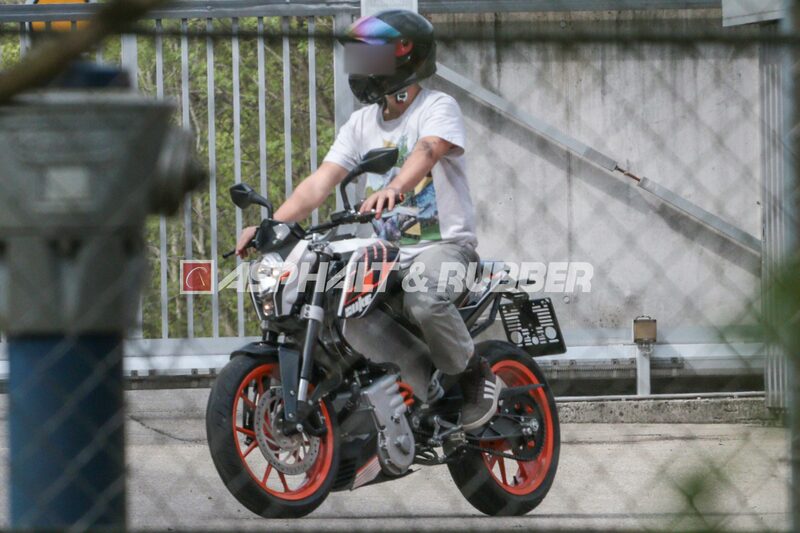 Spy photos from Austria have caught KTM testing a rather interesting motorcycle – one that does not run on a petroleum-based fuel, but rather it has an electric drivetrain at its core. This isn’t the first time that KTM has experimented with an electric motorcycle, of course, with the KTM Freeride E being available in select markets. However, the machine seen here is a pretty big step forward for the Austrian brand, from its modest electric dirt bike. Using the chassis of a KTM 390 Duke to house the battery, inverter, and motor, KTM’s electric street bike (we’ll call it the KTM E-Duke for now) looks like a rolling mess, but is what you would expect from a project in its early stages of development. The choice of the KTM 390 Duke format for the KTM E-Duke suggests that KTM is looking at efficient people-movers for congested areas, and not trying to build an pie-in-the-sky sport bikes. That could serve the company well, especially with its minority owner Bajaj, as markets like India are a better fit for the E-Duke, than say the United States or Europe. Looking at the guts of the machine, we can also see that KTM continues to evolve with its EV designs. A large radiator can be clearly spotted, which suggests at least a liquid-cooled engine, but could also suggest some liquid-cooling for the rather large battery pack (the aluminum box near the top of the bike). More interestingly, KTM appears to have included a gearbox in its design, with a clutch cover spotted on the right-hand side of the machine, and a clutch lever and shifter linkage on the left-hand side of the motorcycle. The inverter and motor appear to be in a single casing, and it is possible that KTM is continuing with its PMAC electric motor design, the same design used on the production version of the KTM Freeride E lineup. In terms of specs, it would be impossible to say definitively from the photos here, but again the choice of using a KTM 390 Duke chassis gives us some hints that the Austrians are looking to make a machine with similar outputs and weights to the 390 Duke, and one that is used for similar mileage requirements. When you think about it, an electric 300cc-class street bike makes a lot of sense with today’s technology. Will KTM take a page from the humpback whale though? Well, that remains to be seen.